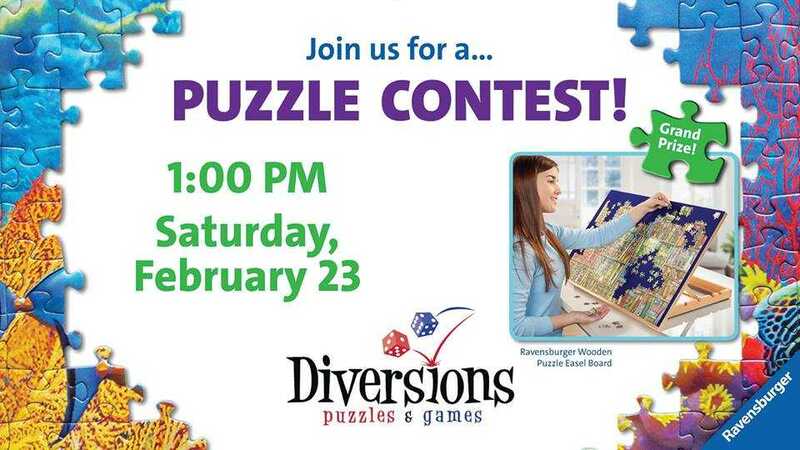 Join us for a special puzzle event with Ravensburger! This event is free to attend (pre-registration is required, please see below). This puzzle competition will pit teams of two against other teams to complete a 500-piece Ravensburger puzzle with the fastest time. However, there’s a catch! No teams will have knowledge of the image that is being used – you have to complete the puzzle without an image for reference! Prizes will be awarded to the first, second, and third place teams, based on the fastest times for completing the puzzle. All of the prizes are being provided by Ravensburger! 2nd place: One 1000-piece Ravensburger puzzle of your choice from Diversions’ available stock. 3rd place: One 500-piece Ravensburger puzzle of your choice from Diversions’ available stock.